Zvezda Service Module. Image credit: NASA. The Zvezda Service Module was the first fully Russian contribution to the International Space Station. Zvezda was launched from Baikonur Cosmodrome by a Proton rocket on July 11, 2000, and docked with the ISS two weeks later. It has a mass of 19,051 kilograms (42,000 pounds), a length of 13.1 meters (43 feet), and a wingspan of 29.7 meters (97.5 feet). Zvezda served as the early cornerstone for the first human habitation of the station, providing the early station living quarters, life support system, electrical power distribution, data processing system, flight control system and propulsion system. It also provided a communications system that includes remote command capabilities from ground flight controllers. 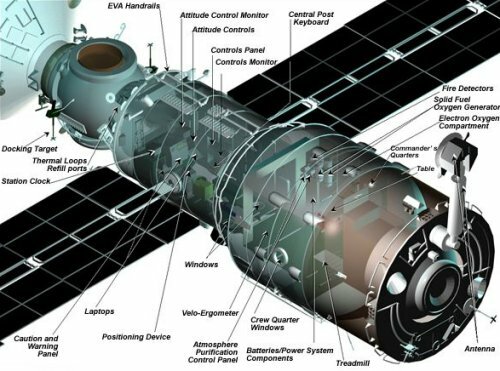 Although many of these systems have now been supplemented or replaced by U.S. station components, the Service Module will always remain the structural and functional center of the Russian segment of the International Space Station.